We are all familiar with the term BOTOX® Cosmetic. However, during your consultation with Dr. Vivian Chin you will have an opportunity to determine if this is the answer you have been looking for to reduce your wrinkles. Botox is a drug made from a neurotoxin produced by the bacterium Clostridium botulinum called botulinum toxin. It is used medically to treat certain muscular conditions and cosmetically to remove wrinkles by temporarily paralyzing muscles. BOTOX® Cosmetic is a procedure that has been safely used to treat a variety of conditions for more that 10 years. How is BOTOX® Cosmetic most often used? Botulinum toxin is injected to treat certain muscular conditions and to cosmetically remove wrinkles by temporarily paralyzing muscles. The facial areas most often addressed are the forehead and wrinkles between the eye brows. Treatment with BOTOX® Cosmetic can visibly smooth and soften moderate to severe frown lines between your brows. Patients often report improvement within just days after their treatment, with results lasting from 3 to 6 months. BOTOX® Cosmetic can also be used in patients who struggle with profuse sweating in areas such as the armpits or patients who suffer from migraines. How is the procedure performed by Dr. Chin? Dr. Chin may choose to numb the area with a cold pack or anesthetic cream prior to the injection. She will first determine where to administer the injections by examining your ability to move certain muscles in your brow area. The location, size, and use of the muscles that create a furrowed brow vary markedly among individuals. 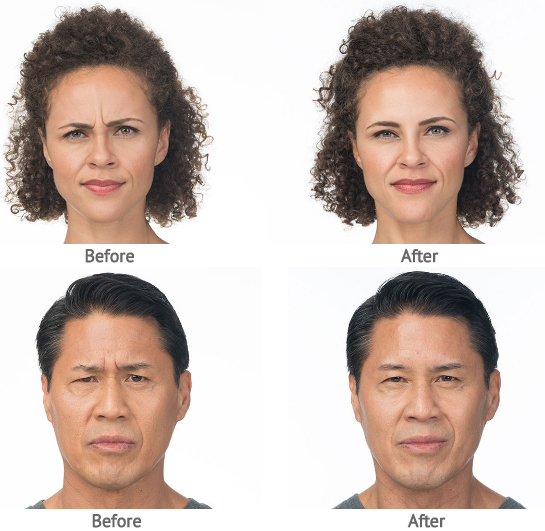 Then, Dr. Chin will administer several tiny injections of BOTOX® Cosmetic directly into the muscles that cause those frown lines between the brows. Patients report that there is little discomfort during treatment, comparing the sensation of a ‘pin prick.’ Patients are able to resume normal activity immediately. The procedure can even be done during your lunch break if you so desire. BOTOX® Cosmetic is also effective for smoothing lines on other areas of the face, including crow’s feet, wrinkled lip lines, and neckband creases. If you have noticed how those moderate to severe lines between your eyes and eyebrows may be adding years to your age, we recommend you schedule a consultation with Dr. Chin. She can determine if you are a good candidate for BOTOX® Cosmetic which can give you a more youthful appearance.